Educational news from SUNY Cortland. See link below for original article and additional photographs. Xena Holzapfel ’12 knows that the history of great civilizations was written in clay. She is absorbing the lesson this summer in the dusty Belize village of San Antonio, where chickens run through an outdoor pottery studio and the female descendants of the ancient Mayans have formed a cooperative to reconnect with the cultural and economic heritage of their forebears. Belize, a small Central American country with a scattered population roughly the size of Buffalo, N.Y., is a relatively untapped archeologist’s goldmine. The rain forests have swallowed most artifacts of a once-thriving civilization, but the remnants of their wondrous cultural gatherings can be found in the shards of ceramic ware left behind. Sharing ideas and clay handling techniques with the indigenous members of the San Antonio Women’s Group in this English-speaking country, Holzapfel feels her life experience just got a big boost. “You’re so shocked taking everything in,” said Holzapfel, who earned a BFA degree at Cortland, of the village women who send their children off to school every morning, then attempt to start an artistic operation in the style of their ancestors. “It’s just a different approach to art, it’s learning through your sense of touch,” said Holzapfel of Lake Ronkonkoma, N.Y. “You can verbalize what you’re learning but to really experience it you have to physically do it. Jeremiah Donovan, a SUNY Cortland professor of art and art history, has taken students to China since 1998, hosting summer classes that explore the region’s cultural traditions as reflected in its ceramics. In January. He turned his attention to the Mayan civilization that reached its pinnacle 1,000 years ago, and revised his successful formula to identify, recreate and preserve for posterity Belize’s traditional styles of pottery making. Donovan’s pilot course, Winter Study: History, Culture, and the Arts, offered for the first time in January, provided Holzapfel and six other classmates a glimpse into the world of the former great Mayas of Belize. Building on that success, he invited three select former student participants to help him launch a formal research project in Belize this summer. Holzapfel, one of those chosen, knew the kind of transformative experience it was likely to be because she had experienced one of Donovan’s classes in Asia. In Belize, Donovan has created collaboration between the three students, the sparsely populated country’s indigenous artisans and Jaime Awe, a leading archeologist from San Ignacio, Belize. Charles Heasley, a SUNY Cortland professor of art and art history, is on hand documenting and keeping notes on the project this summer in multimedia, video, audio and digital still photography formats. “The intent in working with the San Antonio Women’s Group is to combine our hands-on research with the archaeological findings involving sherd (fragment) analysis of pottery production methods and processes,” Donovan said. “We hope to renew the traditional methods by putting the pieces back together both literally and figuratively. “Part of the mystery is that the process for producing the glazes has been lost,” he said. “The chain from grandmothers to daughters has been broken and the women in the group really never used glazes or the pottery wheel. These women are being exposed to different traditions they can’t recreate. For them, there has been a lot of frustration. Donovan is exploring the possibility that the Mayans decorated their vessels using a refined clay slip similar to that in Greek and Roman terra sigillata pottery. When fired at simple kilns found in two locations in Belize, the superfine, colored clays turned into a surface sheen. Shades of cream, white and black commonly decorated the special multi-colored pottery made by the artisans of the palace courts in ancient times. In 2014, Donovan will expand his planned yearlong research project to several different parts of Belize during a sabbatical, assisted by two SUNY Cortland students picked from among course and summer project participants. The students have been practicing techniques to build vessels from coils of clay, rolled slabs of clay and by pressing the substance over molds. 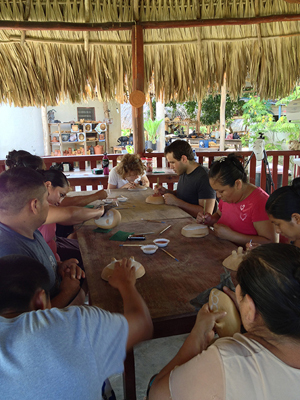 These are all traditional Mayan approaches to their craft. They also are investigating the colored slips that Mayan artisans might have used. One of Donovan’s students, sophomore archeology major Alexandra Abbott of Harpursville, N.Y., took Donovan’s course in January and was among a select group to earn a SUNY Cortland Summer 2013 Undergraduate Research Council grant to support her participation in the summer research with Donovan. Abbott, who has focused her studies on Americas archeology, is helping Donovan reconcile findings at the San Antonio site with another site at Cahal Pech with their colleague, Dr. Awe. Donovan used funding from the Cortland College Foundation to enable both Zampogna and Holtzpfel to participate in the project. Supporting undergraduate research is one of the priorities of Educating Champions, the Campaign for Cortland. That five-year campaign to raise $25 million on behalf of the College’s institutional goals comes to an end June 30. Last semester Zampogna, who is concentrating in studio art, was learning to throw a pot on a wheel on campus. This summer, he’s explored a place in Belize where the raw materials are found. Living with families in tiny rural villages and working closely with the women’s cooperative to resurrect the art as an economic lifeline, the students are making lasting social and cultural connections. “The pottery is the major evidence people have today to figure out the Mayan culture,” said Leah Fries ’12 of Red Creek, N.Y.
Thousands of years ago, the Mayans were busy firing their intricately decorated, ceremonial terra cotta-colored pots at astonishingly low temperatures. In fact, for the early Central Americans in Belize near the border with Guatemala, both the hand-built pieces and their glazes likely were finished in fire pits, not kilns. Fries, presently a SUNY Oswego graduate student in education, first interpreted early civilization’s story in Chinese porcelain. As a sophomore bachelor of fine arts major who took part in Jeremiah Donovan’s summer course, China: History, Culture and the Arts, she discovered that the ancient Chinese, in a process shrouded in time and mystery, pulverized white stone into the raw material for what today is their world-renowned vases and sculptures. In January Fries experienced a new chapter in her education, this time in Belize, rejoining her former mentor, Donovan. Experiences in Belize that resonated with Fries were the class visit to the home of Dr. (Jaime) Awe. She also recalls an excursion that involved entering a cave and wading through knee-deep water to reach the subterranean grounds of a site believed to have been used for a Mayan ritual involving the sacrificial destruction of the elaborate clay vessels. Fries is back in the U.S. and plans to complete her graduate student teaching requirement next fall in Bolivia. “Jeremiah always encouraged us to do research beforehand and I decided I was going to develop a lesson plan based on Mayan culture: what would life be like for the ancient Mayan?” Fries said.